FORMAT : 12 33 1/3 RPM LP ARTIST : Sun Ra TITLE : Secrets of the Sun LABEL : El Saturn NUMBER : FG 9954 MONO/STEREO : Mono LABEL DESCRIPTION : Original Gold Label. This is super rare on orange vinyl and may be the only in existence. This could be your only shot to own this. GRADE & DESCRIPTION (COVER) : Generic Sleeve. GRADE & DESCRIPTION (RECORD) : Has many marks. Plays thru on side one with constant surface noise. Side 2 is the same and has one skip. Still an amazing collectors item of what may be the only one in existence. The record has been cleaned on a VPI 16.5 Vacuum. 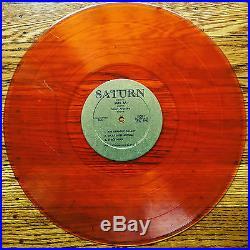 Grading NM, VG++, VG+, VG, VG-, G. The item “SUN RA Secrets Of The Sun ORIGINAL SATURN RECORDS ULTRA RARE ORANGE VINYL LP” is in sale since Monday, June 27, 2016. This item is in the category “Music\Records”. The seller is “thesoundofblue” and is located in Philadelphia, Pennsylvania. This item can be shipped worldwide.